The sixth season of American Horror Story was full of big surprises. And among them was guest star Chaz Bono. As the only child of legendary duo Sonny and Cher, Bono is a well-known figure in pop culture. What’s, perhaps, not so well-known is that he’s a serious actor who’s now embarking on a brand new career path. And American Horror Story is just the next step in following his true passion. Cast as Lot Polk in American Horror Story: Roanoke, Bono enjoyed a pivotal multi-episode arc that allowed him to exercise the acting muscles he’s been diligently training the past several years. The result? A dark, twisted, and all too believable portrayal of a hillbilly trapped by the confines of his cannibalistic and inbred family. Although a newcomer to the show, Bono and his penchant for being a character actor fit right in. On screen he’s gritty and real; and even in this small role, he breathes life into his character. He’s done similar work on stage in productions like “Down the Road” and “Proof.” All in all, Bono’s growing resume is shaping up to be an interesting one. TARA MARTINEZ: It was great to see you on American Horror Story this season! How did you come to be involved with the show? CHAZ BONO: I did a movie called Dirty which came out streaming last year, but I did it two years ago. And when I first saw my scene in that, I immediately was like, ‘I need to get this to Ryan Murphy. If I could just get this to Ryan Murphy, I think he would hire me and give me a chance.’ I’ve been not having the easiest time in Hollywood as far as getting acting work, so I kept trying to, through different channels, get him this. In the meantime, in the like two years it took to figure out how to get stuff to him, I had more things by that time. And finally, my mom realized that she had a contact through a friend of hers and so I got to send a couple examples of my work to him, and I got cast. TM: Did you know ahead of time the type of character you’d be playing? CB: The first thing I heard back was to just not shave. [laughs] And that was like for a good month and a half, two months. So, that was kind of like—and also, you have to understand, I’m a fan of the show, so I was really excited to actually work on something that I love. And then, I finally got a call from Tim Minear, who told me the character that I was going to be playing and he just talked a little bit about the Polk family and that storyline. And that was all I was ever told. TM: So, were you surprised to learn that you would play kind of a different character in the second half of the season? CB: Yeah, I mean, we all started to figure—you start to figure stuff out, obviously. But again, I’ve never seen an entire script of the show. I’ve only seen my sides. But as we were shooting it, we started to figure things out and also our trailers all said “TV Character Name,” so obviously there’s something else happening. So, no. I mean, by the time we got there—no. I was just thrilled to be able shoot, that I was still in stuff after the second part of the show, honestly. TM: The entire team behind American Horror Story does a great job of bringing these stories to life. What was your experience working with them? CB: They’re amazing. I mean, I was so excited to work with the cast because, again, I’ve watched the show since the beginning and know everybody’s work really well. I think they’re some of the most talented actors working today, or working on that show. There’s just not a one who isn’t amazing. And then, I had the good fortune of having every scene that I did with Sarah Paulson and Cuba [Gooding Jr.] and they were both amazing people, amazing actors. Sarah is probably my favorite person that I’ve ever acted with. She just gives so much and is so talented and just so much fun to work with. Also, although I didn’t get to do much with them, but Denis [O’Hare] was just so good. I really was just kind of in awe watching him work and trying to realize like, ‘You’re on camera, you can’t be looking at him.’ Because my mind was going, ‘Oh my God! So good! He’s just going to that place of being cut up on a table.’ He was so brilliant and just watching him, I was just—honestly, that would happen to me a few times when I was working. Same thing with Frances [Conroy]. TM: Would you consider returning for another season of American Horror Story? CB: I mean, I would love to. I’m at auditions all the time and usually it’s for shows that I don’t watch or even know exist. So, again, when you talk to any actor, when it’s a show that you love and you’ve watched from the first season with such talented cast and crew, that’s what you hope for. TM: You were also in several episodes of The Bold and the Beautiful recently. What was that like to film? TM: You’ve done some acting over the years and you’ve been doing even more recently. What do you like most about this particular craft? CB: I like everything about it. I mean, I’ve kind of gravitated towards playing really character-y parts like Lot. Not that I can’t do the other stuff, it’s just kind of what I prefer. I do really enjoy playing bad guys. I don’t know why; it’s just more fun. TM: Because you get to do stuff you’re not supposed to do. CB: Yeah! And I did a play called “Down the Road” that is a Lee Blessing play about a serial killer who’s being interviewed by a husband and wife who are writing his biography. And it’s kind of this psychological thriller because he just kind of invades their lives, their psyche, their everything without ever laying a hand on them—just by talking to them and telling them his stories. It was this kind of play that ramps up as it goes along. It starts off nice and he’s more charming and it just gets more and more intense until the last scene. It’s just so intense. I would literally skip off stage every night and it was such a release of I don’t know what—everything. So yeah, I find that kind of stuff really fun. I love everything about acting. It’s really my true passion. It’s what I’ve always wanted to do. It’s what I went to school for when I was younger. It’s just one of those jobs that you really have to be in the right body physically to be able to do. So, I kind of gave up that dream to do the thing that I love when I was 18 after I graduated from Performing Arts where Sarah [Paulson] went and graduated six years after me. That was a cool thing to find out. We had a lot of the same teachers still there. And then I got back into class in 2012 and it quickly became apparent to me that everything I had been passionate about doing this when I was younger was still there and amplified. TM: In your experience, what’s the difference between being on stage and being on camera? CB: Well, I mean, they’re totally different. They’re completely different feelings. When you’re on stage, there’s an audience. First of all, plays are generally written more for acting. So, you know, you get to really embody and really get to act, whereas TV and movies are not as much of an actor’s medium as theater is because there’s other stuff going on. There are other elements that are part of the storytelling in film and TV, whereas in theater it’s just the actors. And plays tend to be a lot wordier than TV and movie scripts. So, there’s that. And then there’s, again, you’re on stage and there’s an audience. And then on stage, you don’t have cameras and you’ve got an audience, you’ve got room to stretch out and also, you really can kind of get into things because the rehearsal process is really different. You have time to do everything you want to do and really explore and discover. Then, you’re on and you can very much, as an actor, you just can fall into it in a different way. At least, for me, I find in TV and film—you get to that point depending on what it is—but sometimes you have a line. So, you’re acting all that other time. Then there’s cameras and there’s technical stuff, and especially in American Horror Story. There was one scene that we shot with everybody and Denis on the table and stuff; it was a fairly small room and we had, at certain points, multiple cameras in that room. So, it was like, ‘Hey, wait. Don’t step over here.’ There was literally a camera right behind me that was covering, I think, Denis, but it was right there. So, just all this different kind of stuff that you have to deal with and you don’t have the same amount of time. You have to work quickly. It’s just really different. It’s a small punch kind of thing versus a long, slow ride which doing a play is like. TM: What draws you in when considering new roles or projects? CB: At this point in my career, I’ve made a choice not to play any transgender characters because I just don’t want to get pigeonholed in that. And that’s really been the one kind of thing that I’ve stuck to. Once I establish myself as an actor and people actually know that I’m an actor, if something came up that was amazing, I would do it. But at this point, because my love is really character acting, I don’t want to not be able to do that. 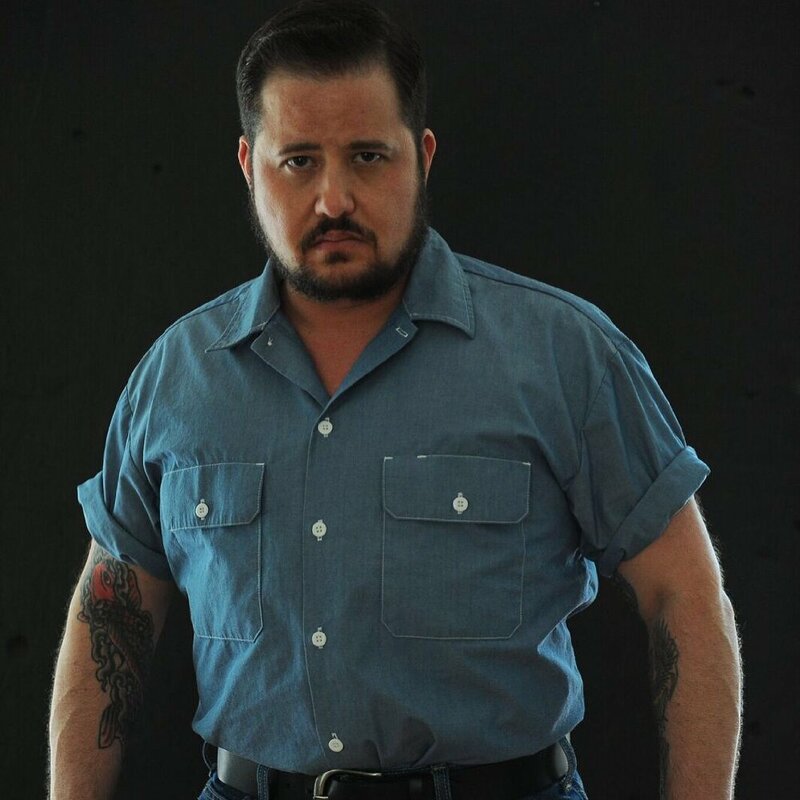 To learn more about Chaz Bono, be sure to check out his IMDb page and follow him on Twitter at @ChazBono.